The AS2000 amplifying platform has two active output stages. It is possible to split the output signal into three directions through the integrated splitters (couplers). It is also possible to bypass the input signal (BYPASS). 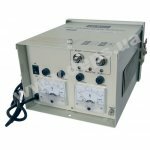 The AS2000 platform is designed to work in long coaxial lines and split the signal in large and very large coaxial clusters. 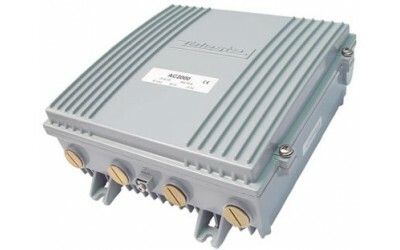 The AS2000 platform has extra powerful output stages with extremely high output level and low level of intermodulation products (DIN 45004B = 129 dBuV, CSO 42k = 118 dBuV), advanced features of remote management, including innovative feature of ALSC (automatic adjustment of frequency response level and slope on the basis of pilot signals). In the minimum configuration AS2000 is a powerful trunk amplifier with 2 active outputs. 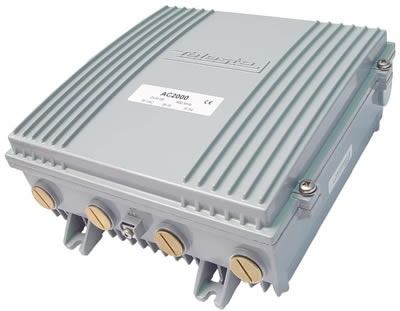 Later the AC2000 platform can be gradually equipped with a powerful backward channel amplifier, modern system of monitoring and remote management which allows the remote management of the platform, and the ARUN (ALSC) functions can be implemented. The required modules can be pre-installed at the plant. Upgrading can be easily done on the operating network on-site directly. Cost-effective platform with two active outputs and the ability to be upgraded. GaAs PD powerful trunk amplifier with high output level. Extremely high linearity and low level of intermodulation products (CTB, CSO, XMOD) at high gain. Output signal can be split by the splitter or coupler inserts in 3RF-outputs. 3main outputs with the passage of remote supply current up to 8 A.
Electrically operated remote control modules of slope frequency response and gain. Automatic adjustment of frequency response level and slope - ALSC function. Interstage slope adjustment by the frequency response equalizer. Adjustments for input - the slope by the frequency response equalizer and transmission coefficient by the attenuator. 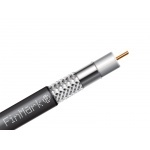 Wide range of the inserts of equalizers and attenuators. Plug-in module of the powerful amplifier of backward channel. Possibility of injection of a test signal of the backward channel through control data points. Developed means of remote monitoring. Availability of monitoring modules compatible with an open HMS protocol. Monitoring modules with integrated signal level meter provide remote measurement of the output level of each analog or digital channel. Remote reduction in the signal level or a complete shutdown of the backward channel (OFF / - 6 / 0 dB) at the coaxial segment damage by ingress noise. Remote measurement of remote power voltage in a line. Remote measurement of the key parameters: output voltage of a power supply unit and temperature in the case. Remote identification of unauthorized opening of the case. The platform configuration is kept in the memory system of monitoring.